(MP183). Alma Claude Burlton Cull (1880-1931). Watercolour signed and dated 1908. Original size: 16 x 9.5 ins (40.6 x 24.4 cms) approx. This watercolour shows the newly commissioned HMS DREADNOUGHT lying to a buoy in Portsmouth Harbour. Although when artists date paintings they are not necessarily telling us that the scene depicted was actually painted that same year, there is no reason to suggest that this watercolour is not of the year 1908, the date Cull gives. DREADNOUGHT (Captain Charles Madden CVO RN) was indeed wearing the flag of a vice admiral in 1908 as shown here by Cull and the newly commissioned dreadnought battleship would have been a natural choice of subject for any keen British marine artist to paint. Vice Admiral Sir Francis Bridgeman KCVO - Commander-in-Chief Home Fleet - had hoisted his flag in the dreadnought on 5 March 1907 shortly after she had returned from running trials in the Channel, West Indies and Mediterranean. Apart from a few small niggles, endemic in any new ship let alone a whole new and radical design of ship, these trials had proved very successful. In particular her steam turbines had run smoothly and reliably over long distances with minimal vibration recorded and the great battleship had been dry and steady in all sea states she had encountered. She had proved surprisingly manoeuvrable, was popular with the men for the relatively spacious accommodation spaces she offered and in every respect she was a step change in performance and habitability when compared with all other battleships afloat. In every respect except one: her rig. Despite exhaustive design effort and thought, the large tripod foremast was poorly sited, for stepped astern of the fore funnel as it was, the vital control top was virtually directly above that funnel. Smoke and sheer heat made the control top largely uninhabitable, a problem that was to persist throughout her life. Naval architects took a surprisingly long time to circumvent this problem which persisted for many years with follow-on battleship and battle cruiser designs. Appointed to DREADNOUGHT and onboard at the date of this watercolour were some officers whose names were to appear for many years hence in the Navy Lists of the time: Captain Charles Madden, Jellicoe's Chief of Staff in the Grand Fleet in the period 1914-16 and the Grand Fleet's Second-in-Command during Beatty's tenure as C-in-C, 1916-1918, went on to become C-in-C himself of the immediate post-war Atlantic Fleet (his son, also Charles, becoming C-in-C Home Fleet in 1962); Lieutenant Roger Backhouse (a future admiral and First Sea Lord), Lieutenant Bertram Ramsay (a future admiral and architect of much of D- Day's plans); Lieutenant Norton Sulivan who rose to command the battlecruiser RENOWN in the late 1920s; and Midshipman James Rivett-Carnac, who also became a 4 ring captain and whose son, Miles, commanded a Daring Class destroyer in the 1960s before retiring to take up a new career. Some old “Wooden Walls” are shown by Cull moored up to the right of the painting with Portsdown Hill as backdrop; and left of centre Cull has painted a starboard bow view of what appears to be a Second Class Protected cruiser, almost certainly of the Vindictive Class. Indeed the exceptionally tall mainmast painted here (and exceptional even by the standards of 1908 when mighty tall masts were in vogue!) suggests HMS VINDICTIVE herself. The navy’s experimental wireless ship at the time VINDICTIVE was able to communicate with other ships at ranges far exceeding others’ capabilities and for this reason she was stationed in mid-Atlantic in late November 1914 to act as wireless relay for Admiral Sturdee’s force when it went south to hunt down Admiral von Spee off the Falklands. VINDICTIVE was later to win immortality at the Zeebrugge Raid in 1918. In the left foreground with quarterdeck awning spread lies a Canopus, Formidable or Duncan class battleship which, with the commissioning of DREADNOUGHT, has become obsolete overnight despite being only some half a dozen years old herself. Alma Claude Burlton Cull was indeed a master of marine paintings, portraying ships with great technical accuracy. His delicate skies and beautifully painted water always managed faithfully to reflect the light patterns and colours and a Cull picture is invariably alive with movement and bustle and the detail here is superb. 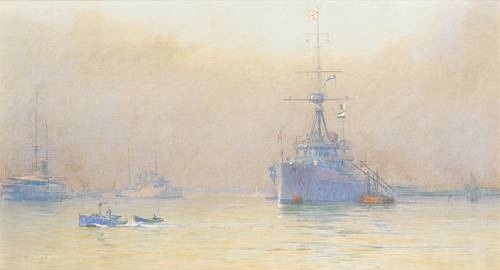 Cull has added to great effect the steam pinnace in the foreground with vice admiral’s badge on the bows whispering her way on an inshore errand from the great battleship out at her buoy and the overall light and colouring of the watercolour is strongly reminiscent of Portsmouth harbour even to this day. This is an important painting of a most important ship that was already revolutionising the design of capital ships around the world.